Implement and validate the necessary internal controls across your entire IT infrastructure before auditors come to call. Investigate incidents that happened in the distant past, by retaining your complete audit trail in a cost-effective storage. Use predefined reports that provide hard evidence of your compliance in human-readable format. It can be challenging to understand all the complex regulatory requirements and know where to start with compliance. 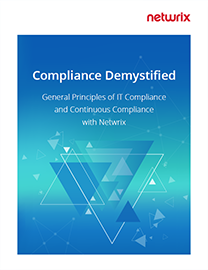 This eBook highlights the main aspects of the most common compliance standards and details how Netwrix can help you achieve your goal of continuous compliance. Medical Center Clinic slashes HIPAA audit preparation from a full month to just 10 days. Mountain Park Lodges proves PCI DSS compliance in just 2 days. Credissimo ensures GDPR compliance and slashes preparation time for audits by 85%. Organizations that fail to achieve and prove regulatory compliance can face damaged reputation, costly fines and even imprisonment of C-level executives. Investing in compliance software mitigates these risks by helping you ensure the confidentiality, integrity and availability of regulated information.